The effective support given IIIAC units throughout the Guam campaign drew unqualified praise from the ranking survivor of the Japanese garrison, Lieutenant Colonel Hideyuki Takeda. After witnessing the overwhelming power of the air and naval units of the Southern Attack Force he concluded that it was no longer possible to defend an island properly with isolated ground troops. This tribute by the operations officer of the main defensive force on Guam adds emphasis to American reports that all supporting arms available to corps functioned with precision and produced excellent results. Construction consisting of ordinary simple buildings reinforced on an emergency basis which received direct hits were completely destroyed. Half permanent positions in which the hard agent cascajo7 was used and which were reinforced with concrete about 50cm thick remained in good condition except in cases of direct hits. Positions receiving direct hits were more than half destroyed. Permanent construction (concrete over one meter thick) positions which received direct hits without exception remained perfectly sound. All naval gun emplacements in the open were completely demolished before the landings. About half of the guns emplaced in caves with limited fields of fire remained operational, but soon after opening fire at the time of the landings the cave entrances were demolished and the guns could fire little. 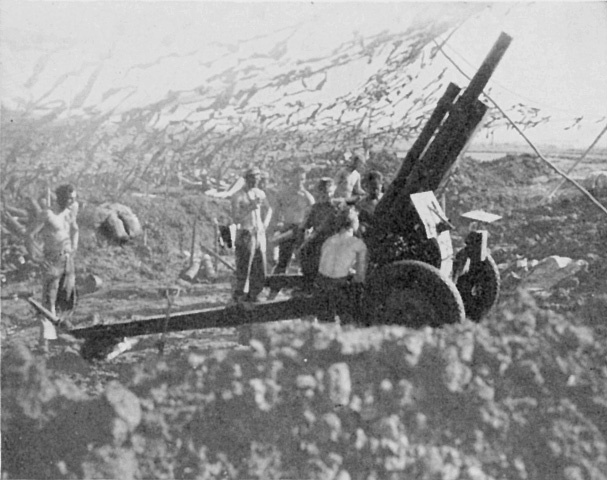 Antiaircraft artillery sustained damage from naval gunfire only once. Communications installations were not damaged, since they were constructed in dead spaces where they could not receive direct hits. Harbor installations received almost no damage. Only once did water pipes receive a direct hit. Power installations were not damaged because generating was done in caves. Most boats in military use were sunk, but by strafing rather than by naval gunfire. Antiaircraft gun positions were operational until the very last. There was no effect against construction in valleys or in the jungle. Also there was very little effect against the interior of the island over four kilometers from the shore line. Until noon nothing unusual occurred, but a formation of about 30 planes strafed and bombed the airfield and other places throughout the afternoon. I realized that finally the enemy striking force was closing in. watch dry-eyed. "The tragedy of war" was never so real. . . . Towards evening enemy planes appeared and halted our construction. . . . As usual, the enemy planes attacked furiously, so we could not venture out. . . . Our position demolished today by bombs. GUN CREW swabs the bore of No. 4 Gun, Battery C, 7th 155mm Gun Battalion after firing in support of the 3d Division beachhead. trucks stranded on the reefs during the landing, commanders were unanimous in their praise of the vehicle. As soon as the "A-frame" unloaded the howitzers, the vehicles returned to the ships to get more shells to bring into the battery positions. Communications between forward observers and the fire direction centers proved to be adequate, with the SCR 300 once more giving reliable radio service. As usual, most of the traffic was carried over telephone lines, and the use of the forward switching central28 proved to be the answer to keeping artillery fire missions coming through from front line observers. CAMOUFLAGE NETTING covers the gun pit of a 105mm howitzer as a 12th Marines crew prepares to place high-angle fire on Japanese positions. 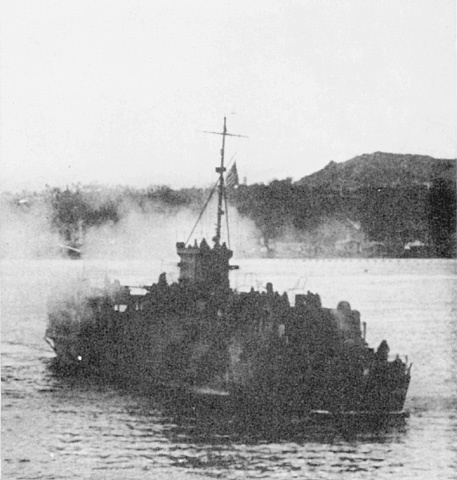 Island pounded both faces of Orote Peninsula, while searchlights of the 14th enabled night surveillance of possible water routes of withdrawal. 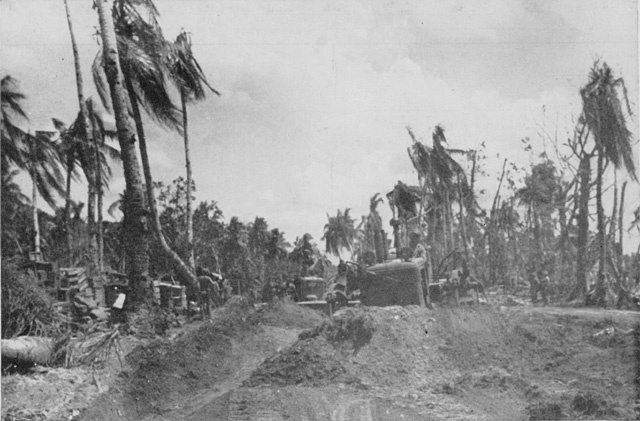 SEABEES on bulldozers prepare the bed of a new road linking the Agat Bay area with the IIIAC front lines. maintaining supply routes, disarming mines, clearing road blocks, and establishing water points can leave little doubt of the engineer's important role in any tactical scheme of maneuver. 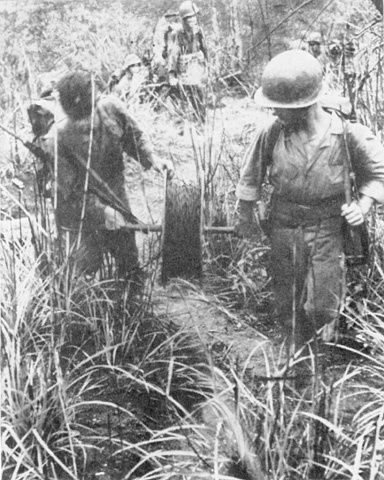 POLE AND SATCHEL CHARGES are carried by a 19th Marines patrol moving forward to investigate a cave reported by 21st Marines scouts in the vicinity of the Japanese division command post. 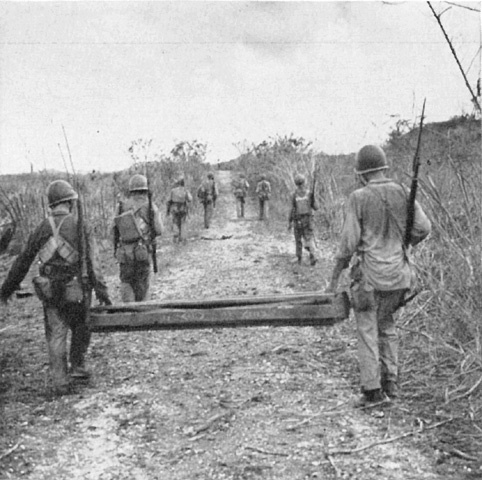 During the initial phase all units of the 19th Marines (engineers, pioneers, and attached Seabees) except the Headquarters and Service Company were assigned to combat teams. Brigade carried out a similar plan and both units employed personnel in the same fashion. 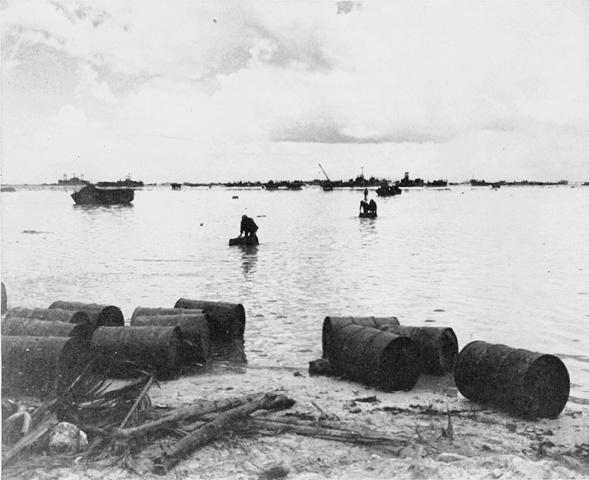 The Seabee units worked the beach areas, being charged with the responsibility of maintaining the main supply road. Marine engineers supported the infantry regiments to which attached, and in addition occupied defensive positions at night to back up weak spots in the thinly-held front lines. To say that the engineers and pioneers were wholly responsible for the smooth flow of supplies during the first phase of the Guam campaign would be somewhat exaggerated. It cannot be questioned, however, that their work greatly facilitated this tremendous task. DYNAMITE STICKS tossed by Marine engineers explode as they seal another cave in the continuous task of silencing bypassed enemy positions. MEN OF THE SHORE PARTY roll gasoline drums through the water over the reef toward a temporary dump on the beach. WAR DOGS and their handlers accompany advancing troops of the 3d Division as they move forward from the northern beachhead. 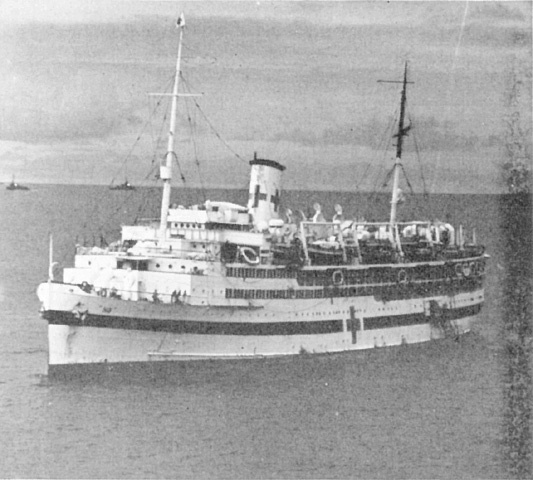 rapidly was that Admiral Conolly permitted some of his ships to continue discharging cargo throughout the first night.40 Thereafter, when commanders assured Conolly that sufficient materials were ashore for any emergency, unloading activities ceased between midnight and 0530. This did not affect the shore party personnel on the beach, however. Work continued on an around-the-clock basis except when the tactical situation required the men to occupy defensive positions. In the northern sector the 3d Division had a provisional war dog company of two platoons. It found the dogs a welcome addition to protective forces and particularly effective when used for night security. During the early stages of the fighting the dogs were nervous and inclined to bark if the enemy came too close, but handlers quickly overcame this habit by teaching the animals to alert silently. Even before this fault was corrected, their mere presence on the front lines had a good effect on troop morale. Men felt secure and could spend more restful nights when not actually on watch. WIREMEN close behind assault troops lay a line to a forward command post. Another task assigned to the four-footed fighters was working with the military police companies to patrol areas, protect supply dumps, guard trails, and insure protection of other installations. This released regular MP personnel, permitting them to carry out other duties. usual, MP's guarded all prisoner of war stockades and also maintained a protective watch over civilian camps. The only other complaint was that the long voyage had caused idle storage batteries to lose their charges. At first this created some concern, but the situation was quickly rectified and thereafter radio communications proved reliable. The use of Navajo talkers47 kept radio transmission interception at a minimum, but the Japanese attempts at jamming were more successful. However, this interference proved more of a harassment to operators than a stumbling block to the accomplishment of their mission. BANDSMEN in their combat role of stretcher bearers carry a wounded Marine down out of the hills. The system of having division wire teams work with infantry regiments paid high dividends. Formerly these teams would advance along hastily laid ground wires of the battalions. These lines then became circuits between regiment and division and presented a maintenance problem that lowered efficiency of wire communications. On Guam division teams moved with the regiments and kept two overhead lines close behind the front in the direction of anticipated CP displacements. In this manner wire communications were usable more quickly and once established more easily maintained. Corps wiremen advanced with division CP's in the same fashion to keep overhead lines constantly ready for use.48 As a result of having both radio and wire transmission available most of the time, commanders had few complaints about communication breakdowns during Phase I activities. 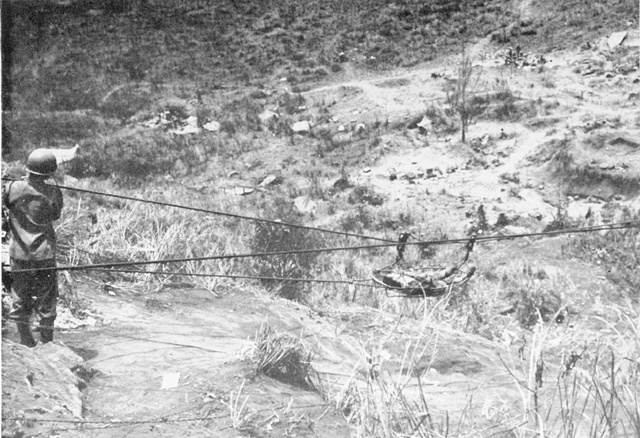 CABLE LIFT built by the 19th Marines used to evacuate casualties from the top of the steep ciiff in the 21st Marines zone of action. 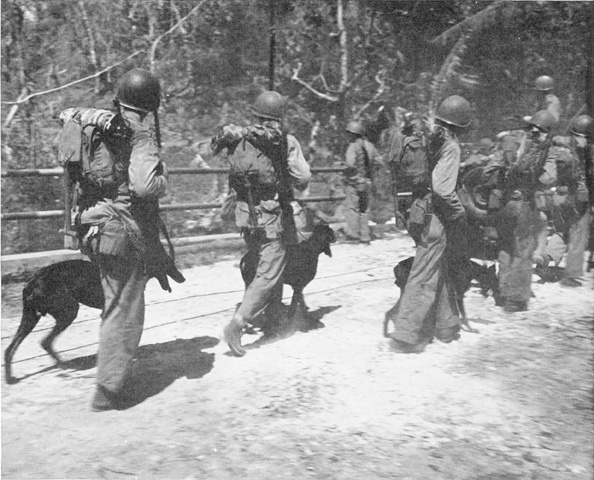 As in other Pacific campaigns, naval corpsmen and army aidmen with the assault infantry units forged the first link in the chain of evacuation. After treatment by these front line medical personnel, the wounded moved to the rear as rapidly as possible. Ambulance jeeps carried much of the load, but when the terrain proved impassable for vehicles, manpower was employed. Marine bandsmen who put aside their instruments to perform their combat mission as stretcher bearers bore the brunt of this assignment. The stark whiteness of the hospital ships lying off shore, with their distinctive red cross, was a great comfort to the man in the front lines. To him they were a symbol of cleanliness and reassurance that casualties would receive the best medical treatment in the world. Coupled with this was his faith in the corpsmen and aidmen whom he had seen day after day saving many a life at the risk of their own. Much credit must be given to the medical services for the high morale of the men on Guam and the aggressiveness they showed in securing the FBL. 1. TF 56 NGF Rpt, 71. 2. IIIAC SAR, NGF Rpt, 3. 3. CTF 53, OpRpt, NGF Comments, 11b. 5. TF 56 NGF Rpt, 72. 7. A type of coral used as gravel in concrete construction. 10. CominCh P-007, Chap 3, 13-14. 11. Ibid., Chap 3, 11. 12. The 3d JASCO was not scheduled to complete training at AmphibTraComd, PacFlt until too late to be employed on Guam. Such a need was felt for the JASCO, however, that it was made available in a state of limited training and attached to the 3d MarDiv for the operation. TF 56 NGF Rpt, 67. 14. CinCPac-CinCPOA Item 11,943--Diary of Lt Kanemitsu Kurokawa, IJA. 16. Ltr Adm R. K. Turner to Maj C. W. Hoffman, 13Mar52. 17. Ltr Col J. R. Spooner to author, 12Aug52. 18. 3d MarDiv SAR, Air Support Comments, 1. 19. 1st ProvMarBrig OpRpt, 14. 20. IIIAC SAR, Air Rpt, 5. 21. TF 56 Air Rpt, 6. 22. 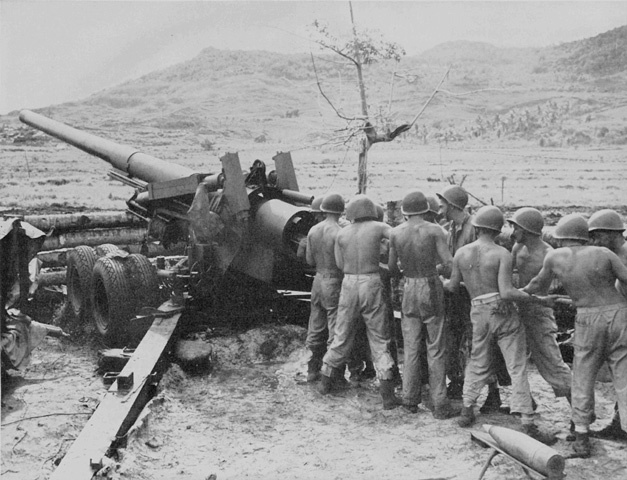 VAC artillery battalions participated in the Saipan operation, but were attached to the 10th and 14th Mar. Corps artillery support was supplied by battalions of the Army's XXIV Corps Arty. 24. IIIAC Arty SAR, Enclosure B. 26. LtCol A. L. Bowser's 3d Bn, 12th Mar landed from nine LST's, two AP's, and one AK. Bowser. 27. 12th Mar SAR, 5. 28. 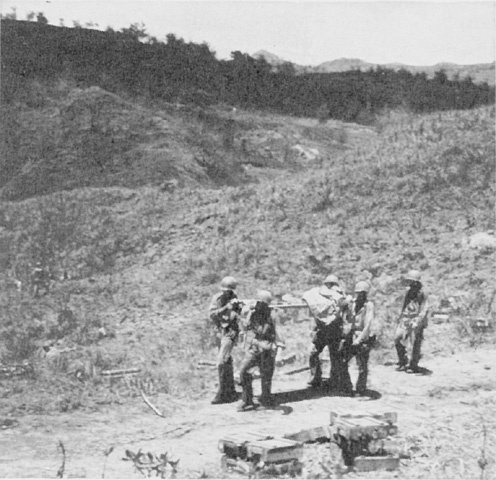 This system established a switching central in the vicinity of the infantry regimental CP from which wire was laid forward to observers and trunk lines run back to the fire direction center. 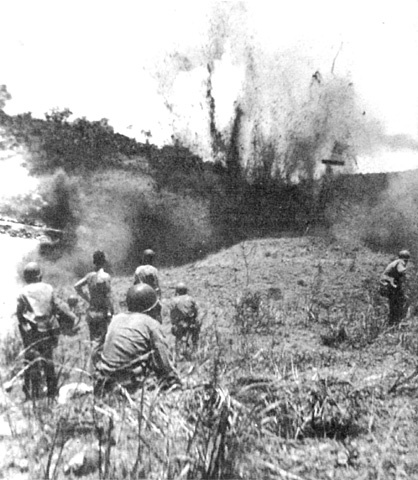 Forward observers and liaison wire teams were able to maintain the shorter line much more easily, which resulted in better wire communications to the firing elements. 29. Ltr Col E. O. Price to CMC, 26Aug52. 30. 1st ProvMarBrig OpRpt, 18. As an indication of the effect of artillery on the Japanese, a POW from an infantry company of 2/38 stated that his unit was nearly wiped out by artillery after the landing. IIIAC POW Interrogation 24. 31. IIIAC SAR, SerGruRpt, 5B. 33.These dozers were prime mover tractors equipped with angle dozer blades and could be used for the dual purpose of moving artillery pieces and digging gun pits. 36. 77th InfDiv OpRpt, DivEngRpt, 1. 37. IIIAC SAR, SerGruRpt, 1C. 38. TF 56 TQM Rpt, 26. 39. IIIAC SAR, Personnel Rpt, 1; Scheyer. 40. CTF 53 OpRpt, OpLog, 35A. 41. IIIAC SAR, SerGruRpt, 6. 42. Ltr Maj R. J. Parker to author, 6Feb52. 43. J. A. Isley and P. A. Crowl, The U. S. Marines And Amphibious War, (Princeton, 1951), 387-389. 44. 1st ProvMarBrig OpRpt, 13. 45. 2d and 3d War Dog Plats SAR, 1-4. 46. IIIAC SAR, SigCommRpt, 1. 47. These were Indians of the Navajo tribe especially recruited and trained by the Marine Corps to operate voice radio nets. They used their own language, completely incomprehensible to the Japanese, to transmit vital messages. 48. Ltr Col A Sutter to CMC, 25Sept52. 50. IIIAC SAR, MedRpt, 3. 51. TF 56 MedRpt, 2A. 53. At Eniwetok, Capt John T. Bennet, (MC), USN, the Solace's Medical Officer, decided to attempt to take whole blood into the combat area on board the ship. Success of the experiment depended on the ability of the living blood to survive the disturbance created by the engines and the pitching and rolling of the ship. On 21 July volunteers were requested from the Marine garrison and over 300 men from the 10th AAA Bn (Reinf) came forward. Of this number, 100 were chosen and the following morning, 22 July, the ship set sail for Guam with a 100-pint blood bank. The experiment was a success and at Guam there was ample whole blood for required transfusions. 10th AAA Bn (Reinf) WD, July 1944, 3. 54. CTF 53 OpRpt, MedComments, 21.